Today’s edition of Picture in Time is back in Nottingham for another view taken in the early days of the new tram system. 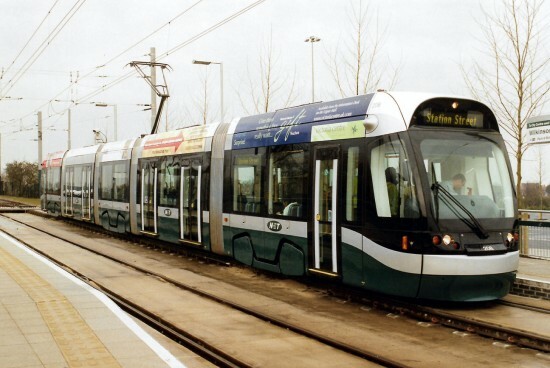 The featured image below shows Incentro 208 at Wilkinson Street on 10th March 2004 – the second day of public services on Nottingham Express Transit. The tram is calling at the stop with a service which will run through to the terminus at Station Street. 208 is one of 15 Incentro trams constructed by Bombardier at their Derby works which were ordered for the opening of the network. The tram carries the original fleet livery of green, black, silver and white.